ODS Red-Line, a series of sensors with the same physical dimensions, but with different measuring ranges and different resolutions.The measuring principle is optical triangulation, as it is in all our sensors. Compared to the other ODS series, the Red-Line sensors are physically bigger, and they are in generally being used for larger measuring ranges or for applications where a longer stand-of distance is needed in combination with high resolution. The three 200 mm models and the 100 mm model are particularly appropriate for thickness/difference measuring in heavy industry, as in connection with cold or hot rolling of steel and metals. 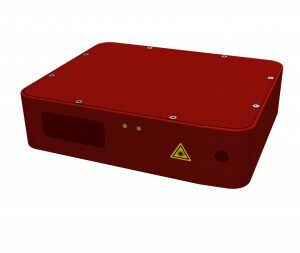 ODS laser Red-Line models are available with measuring frequencies of 1 kHz, 2 kHz, 5 kHz and 10 kHz . The higher measuring frequencies meet a demand for better time resolution, in other words a shorter distance between the individual measuring points on a moving target surface. But the motive for using higher measuring frequencies can also be a wish for obtaining higher or the highest possible resolution by averaging the measuring results. All ODS laser Red-Line models have a Select functionality, meaning that the sensor can be programmed to create a user defined running average before the measuring results are being outputted. Amongst the various filtering possibilities are median filtering, simple average filtering, compressing many data point into a single measurement value, level mode and sample-hold mode. All filters and modes can be combined and calculations are performed before the digital value is converted to the analog output value. Software with every ODS sensor provides easy setting of the Select parameters. There are 2 simultaneous outputs: One Serial interface, and one analog output, 1–9 VDC or 4-20mA, chosen at the time of ordering. The standard Serial Interface is RS232, but an RS422 or an Ethernet interface can be ordered if the application requires it. RS422/Ethernet is needed for cable connections over longer distances than app. 10 m. RS422/Ethernet is also required for Baud rates of 230400 corresponding to an output rate of 5 kHz, or 463800 baud for 10 kHz. It is however possible to use RS232 even for the 5 and 10 kHz measuring rates as long as the baud rate is kept at 115200 or 38400, corresponding to a 2½/2 kHz or 1 kHz output rate. The analog signals are always updated at the measuring frequency. The single sensor is measuring distance to the target, but if two sensors of the same type (or the 5 models mentioned above) are interconnected they will automatically synchronise as a master and a slave unit. If the two sensors are measuring from each side of an object, the master will output the thickness/width variation. Distance measurement on target with High Temperature. To meet this demands, the ODS Red-Line family can be modified into High Temperature version to reach different levels of temperature, basically named HT, VHT and VVHT. As a rather unique feature the VVHT version are capable of measuring on extreme hot target surfaces up to 2.200ºC using.measuring the HT versions are the answer. As a rather unique feature the VVHT version are capable of measuring on extreme hot target surfaces up to 2.200ºC. The applications where the ODS Red-Line sensors can be used are innumerable. From steel- and metal industry to offshore industry – simply everywhere a non-contact precision measurement is advantageous. The sensor is very robust and the housing is made of solid aluminium. Many of the sensors are being used in very harsh environments. Many ODS Red-Line sensors of various models are used in steel works, measuring on cold and hot steel in various production processes. Measuring dimension of zinc ingots. Measuring thickness and width of steel slabs. Measuring position of hot moulds for large tyres. Measuring position of product during processing. Measuring ground level on big vehicles.